There’s a whole new hybrid Lexis IS heading to the UK this summer. The IS300h has an effective electric motor coupled to a 2.5litre petrol engine which should bring in excess of 65mpg. The car has 217bhp and Lexus say they are aiming to get it below the 100g/km mark. That’s quite impressive work considering the size of the car and what it can do. There’s also a non-hybrid version in the IS250 which has a 2.5litre V6 engine producing 204bhp. A new driving position, say Lexus, is making the car more ‘driver focused’ but there are also handling improvements such as s stiffer front suspension to help reduce roll. The new model has a sportier feel and much better cabin which has been heavily influenced by the firm’s excellent LF-CC concept car. 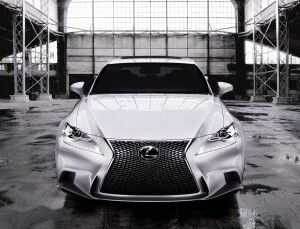 Lexus say the cabin is ‘clean and elegant’ and is ergonomically focussed on the driver. Wider wheels will bring more agile handling and it has a longer wheelbase so there should be more room for passengers, apparently it’s the largest amount of space in its class. The new Lexus IS has just made its debut at the Detroit Motor Show and prices will start at around £23,000 for the IS250 and rise up to £32,000 for the IS 3000 hybrid. This entry was posted in Car Updates & Releases, Executive Cars, Family Car, New Cars, News and Views and tagged car, Detroit Motor Show, electric motor, hybrid Lexis IS, lexus, Lexus IS, LS, MoT, price, Sport, UK by Steve Lumley. Bookmark the permalink.